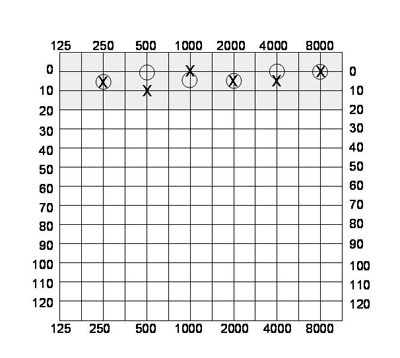 The results of a patient's hearing screening are illustrated on a graph called an audiogram. 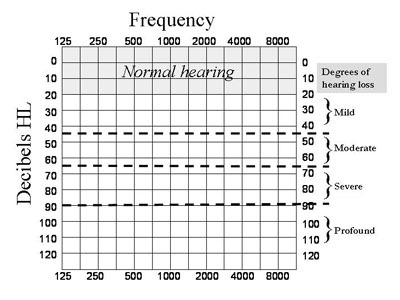 An audiogram indicates how much hearing varies from normal and, if there is a hearing loss, where the problem might be located in the hearing pathway. Frequency or pitch of sound is measured along the horizontal axis of the graph in Hertz (Hz), from 125Hz to 8,000Hz. The higher the measurement, the higher the pitch of the sound. For example, 250 Hz sounds like middle C on the piano, while the high pitched ringing of the telephone is about 3,000Hz. Normal, young, healthy human ears can hear frequencies as low as 20Hz and as high as 20,000Hz. However we only test hearing in the range of 250Hz to 8,000Hz, as most sounds of speech occur in this frequency range. Loudness or level of sounds is measured along the vertical axis of the audiogram in decibels (dB). Zero decibels (0dB) does not mean 'no sound' - it is just extremely soft. Conversational voice level is around 65dB, and 120dB is very loud - about as loud as a jet taking off if you are standing 100 metres away. The audiogram shows how loud a sound has to be for the patient to hear it at a particular frequency. 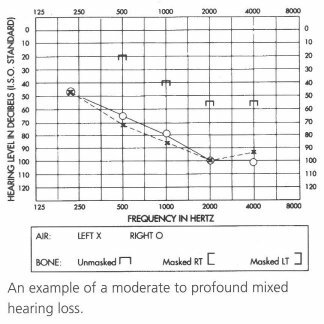 Air conduction thresholds for the right ear (that is, the softest sounds the right ear can hear at each frequency) are marked as an 'O' and the left as an 'X' on the audiogram. 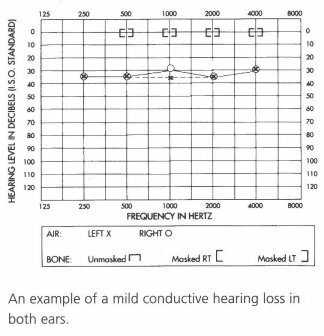 Bone conduction thresholds are marked on the audiogram as (better ear), [(right ear) or] (left ear). In the example above, the patient can't hear high pitched sounds as well as the low pitched sounds. You can see this by looking at the sloping line on the graph: as the frequency increases the required sound level also increases before the patient can hear it. What does the audiogram mean? If the hearing thresholds obtained by bone conduction are the same as the air thresholds, this indicates no blockage in the outer or middle ear. The hearing loss would be caused by a loss of sensitivity in the cochlea or hearing nerve. 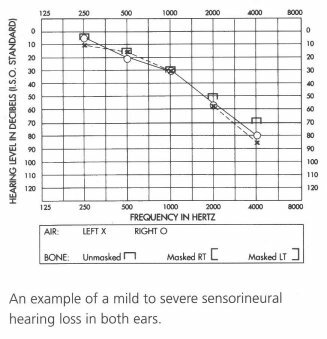 This is called a sensorineural hearing loss. A sensorineural hearing loss can be caused by exposure to excessive noise, or by the ageing process. There is rarely any medical treatment for sensorineural hearing losses and so the impairment is permanent. If the bone conduction hearing thresholds are normal, but there is a loss of hearing for air conduction sounds, this is called a conductive hearing loss. This means that the cochlea is normal, but there is some blockage to sound in the middle or outer ears. Middle ear infections can cause a conductive hearing loss. Middle ear conditions caused by these blockages can often be corrected by medical or surgical treatment. 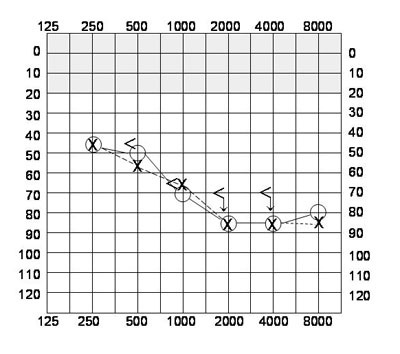 Here is an example of an audiogram indicating a mild conductive hearing loss in both ears. It is possible to have both a sensorineural and a conductive hearing loss - for example, if a person has a noise caused impairment and a perforated ear drum. This is called a mixed hearing loss. The degree of hearing loss essentially describes the degree of impact on a person's everyday life. Profound (91 dB) - almost all sounds are inaudible. Most people with profound hearing loss benefit from a hearing aid. A cochlear implant may assist these patients. Hearing is described as normal if the hearing thresholds fall between 0 and 20dB. Reproduced with the kind permission of Australian Hearing. 1. Australian Hearing. What is an audiogram? Copyright 2010. http://www.hearing.com.au/ViewPage.action?siteNodeId=218〈uageId=1&contentId=-1 (accessed Aug 2013).